He had his vet visit yesterday and his bloodwork came back today. He’s a-okay! And we are all guessing he’s about four. For what he’s been through, he’s a very healthy 100 lbs. The past week has brought to light many things, and first and foremost, before he was neglected, Baby was definitely loved. He does great on a leash. He sits, shakes and comes when I call him. He does really well with strong boundaries, he likes to know where he stands. He loves being around Bixby and Scout, they help him know the rules. And do you know how I was convinced he was loved once? He knows what donuts are and loves them. It has been the only thing he’s ever begged for since he arrived. And just the sight of them made him so very happy. He does great with men and women, I haven’t had him around kids, but I would trust him around older kids for sure. While he loves his scritches, he also is happy to just be on his bed near all of us. My awesome vet, and his tech, really pushed his limits yesterday. They wanted to see what his temperament was like and he passed with flying colors. He got growly, as I would expect as his boundaries were breached, but he never snapped or even bared his teeth. He was confident and even went up to both of them later to get scritches. And it turns out most of his skin scarring is allergy related and the vet thinks they will heal up completely. Which is a relief, because I really thought it was from being in a too-small crate. 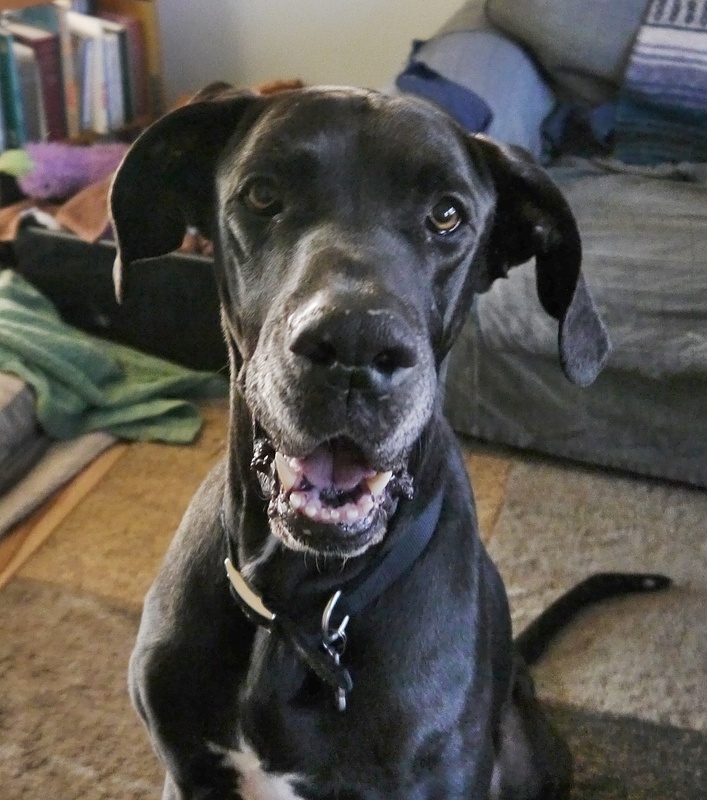 He has not licked his hotspots while he his here – he’s on good food and no corn, which causes allergies in most Danes. He’s still tentative around my cats, but I haven’t had time to work with him on that because I don’t want to put the cats through that stress since he is only here short-term. I’m going to say chickens and ducks are a no-go. As far as he has come in this short week, I have no doubts he will make an awesome companion in the right home. 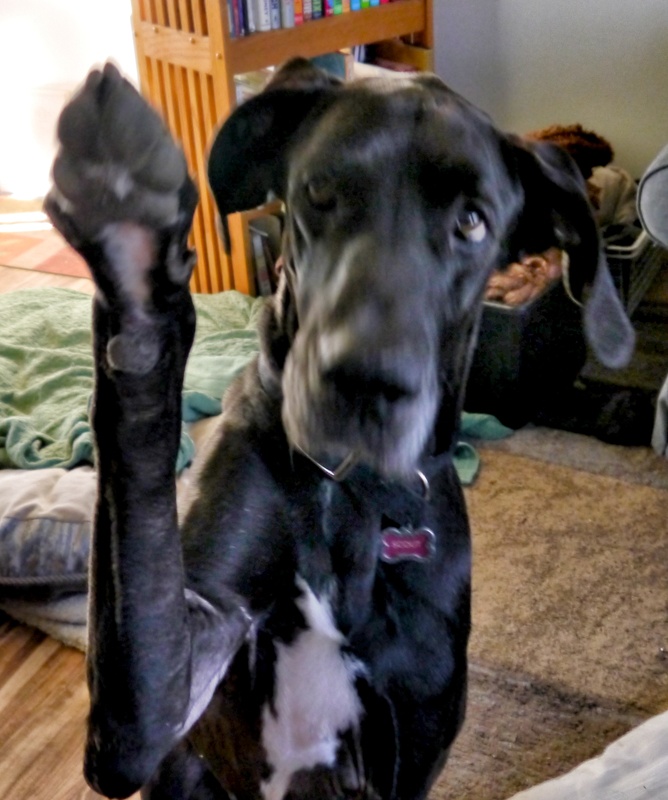 He’ll need someone who knows how to set loving boundaries, is patient as he relearns what it means to be a house dog. He would do best with another dog friend. 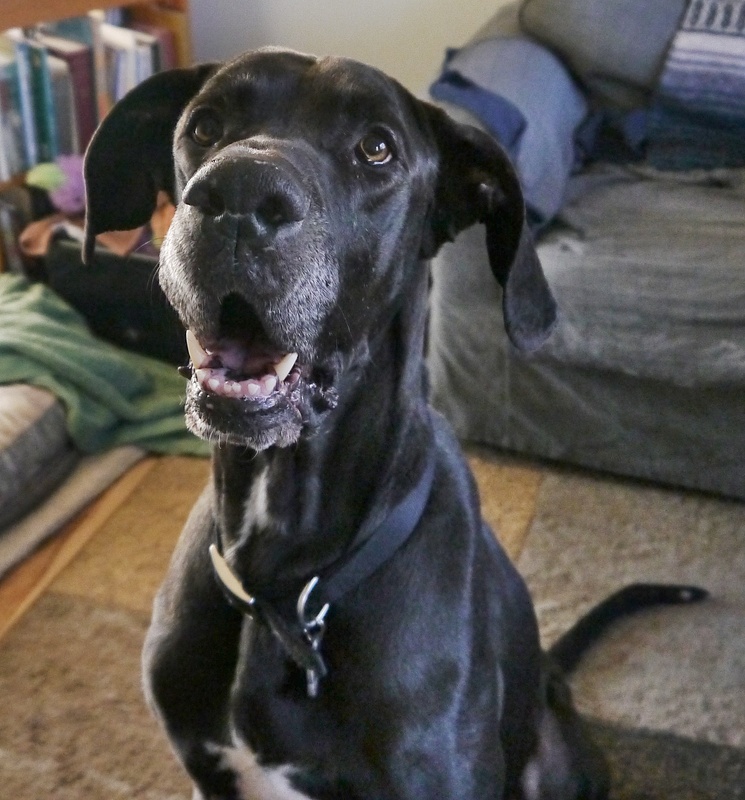 His person will need to make sure he is neutered (soon, as the vet worries about some Dane related issues with his age and intact status), and continues on his feeding schedule until he puts on more weight. His teeth are in good shape, but will need a good cleaning. He may need a therapeutic bed because it will take some time for his hindquarters to regain their muscle and fat levels. You are the best, TaMara. He looks so good and sweet! And donuts! My Koda also loves donuts more than almost anything. Hope Baby finds a great home and all the love he deserves! Fingers-crossed the right people find him. He’s a great dog. That is a very sweet face! Good on you and extra scritches to your co-foster-leads who are showing him the ropes.